The Front Porch takes an international trip...across the river to friendly Windsor, Ontario, Canada. 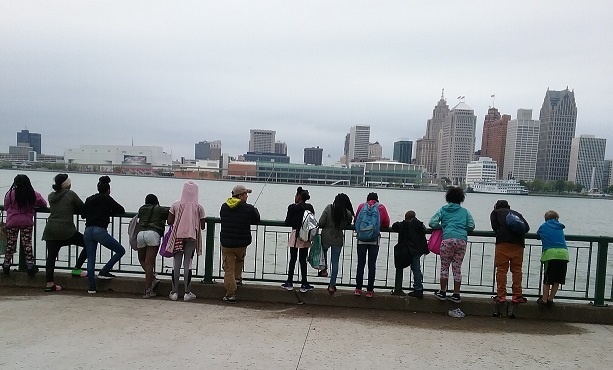 Providing educational and recreational activities and opportunities to youth in Detroit according to their interests, initiatives and needs since 1997. We started as a part of a block club in 1995 with one volunteer, five kids, some books and origami. Now there is a group of over 50 kids, ranging in age from five to seventeen. The Front Porch extends to all these kids' friends and relatives who visit the neighborhood. If children have a safe, informal place where they are free to express their opinions and explore their talents and skills, supported by adults, and to meet other kids in their neighborhood within a structure and develop a sense of safety and true neighborhood then we should see a change in the attitude of the children and eventually the whole neighborhood. It should not be just a place to live but an interdependent place in which to grow, communicate, learn and explore: a safe place from which to begin a life not bounded by a neighborhood, but rather a life rooted in a place that is a springboard to the world. Please email us at frontporchdetroit@yahoo.com. Let us know if you would like to be on our update email list. Like our Facebook Page where we post updates. our many individual donors, our teachers, and our volunteers who generously give their time and dig in the dirt with the kids, get donations and think of us often. When we say we use every available resource in the community, we mean it. *in alphabetical order. Every single effort has made opportunity for the kids on the Porch. The Front Porch: A Youth Program Based Solely on Relationships in Where Do the Children Play? by Elizabeth Goodenough. Published by Michigan Television in 2007. Hush Your Mouth Article by Erin Moran.